Suppliers of high quality fish and shellfish to the Isles of Scilly for as far back as we can trace! Preparations are well under way for the season ahead - The Tradewinds, the Island Fish workhorse is having work done on her deck to put in new non slip matting before a complete electrical re-fit. Besides a full paint up the Emerald Dawn is having some new rails fitted and just a general 'check up'. All being well both boats will be in the water mid March, as long as the weather is looking something like! If you can't wait that long you can whet your appetite with our New 2019 Leaflet which outlines some of this years new offerings. Meanwhile Mark is busy mending pots and making up back ropes for 100 more pots that are due to arrive mid February, a few more pots both to enlarge the fleet but also some to replace those that were lost during the course of last year due to bad weather or those that simply got caught on the seabed and 'parted out' when being hauled. Celebrating his 75th birthday this year Mike has also treated himself to a few more pots - just to keep things ticking over! 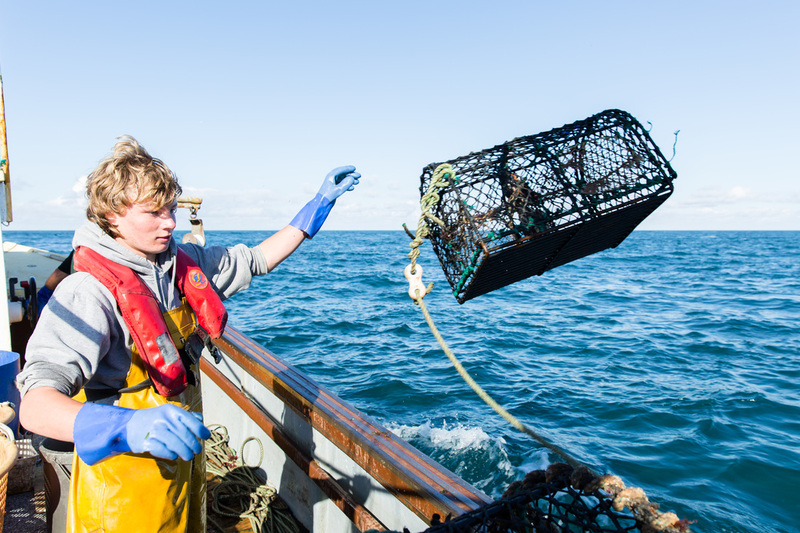 Weather permitting we will be open for business on the 1st April 2019 - but if anyone would like lobster or crab before then do email contactus@islandfish.co.uk as we do have a few strings of pots in the water that we are hauling from the punt. The Pender family has been fishing out of Bryher for hundreds of years. Island Fish is continuing this proud family tradition with three generations of Pender’s following in the footsteps of their ancestors, supplying quality lobster, crab, wet fish and shellfish products across the islands. We supply restaurants, hotels, cafes and shops across Scilly. We also sell direct to individuals: locals and visitor's to Scilly via our shop on Bryher, our pop up stall on Tresco as well as taking telephone/email orders 7 days a week. 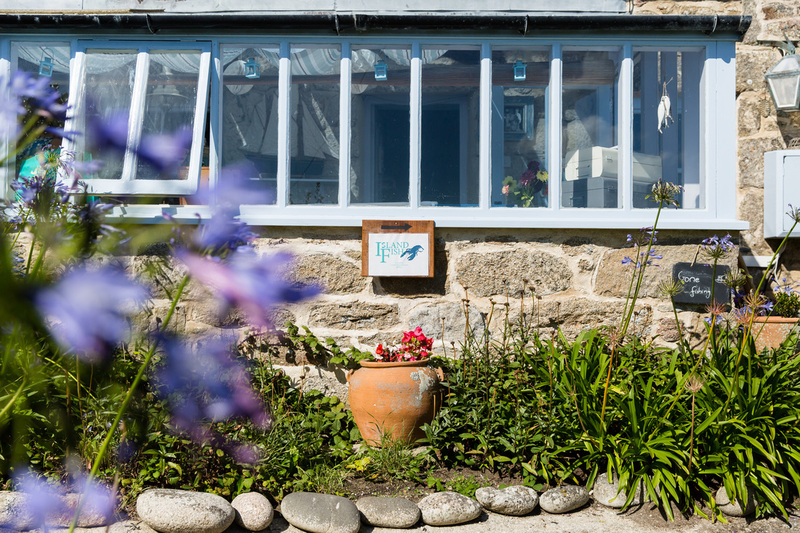 We deliver free of charge direct to Tresco five days a week and across the islands according to demand. As a small family business we are committed to meeting the needs of our customers, wherever they are and whatever they want - just pick up the phone and give us a call. Mackerel & Crab on display at our 'pop up' stall, Tresco. 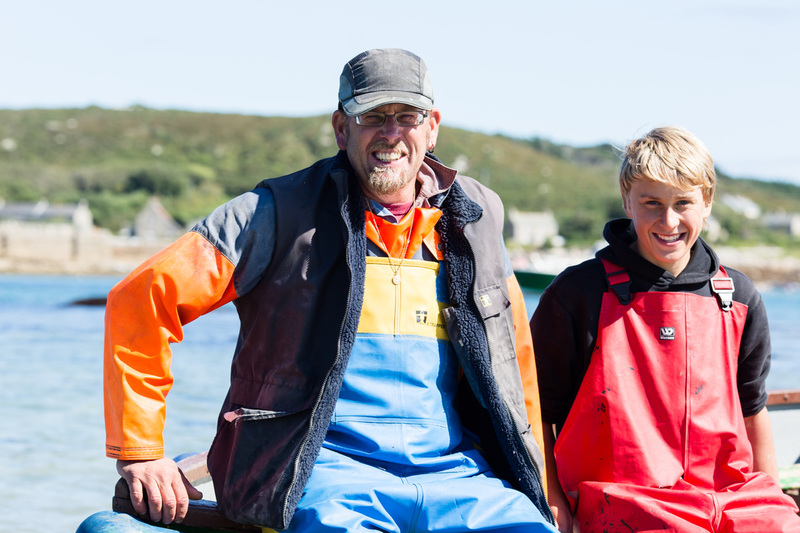 Father and son Mike & Mark Pender go out daily to fish the waters around Scilly in ‘The Emerald Dawn’ (which Mike built himself) and the ‘Tradewinds' - supported in (2018) by 'The Helgi Mor' (Hound of the Sea) skippered by 18 year old Shamus Pender-Frazer. They drop their 'pots' anywhere from Bishop Rock to the Eastern Isles to bring you the very freshest of local fish & shellfish, April through to December. 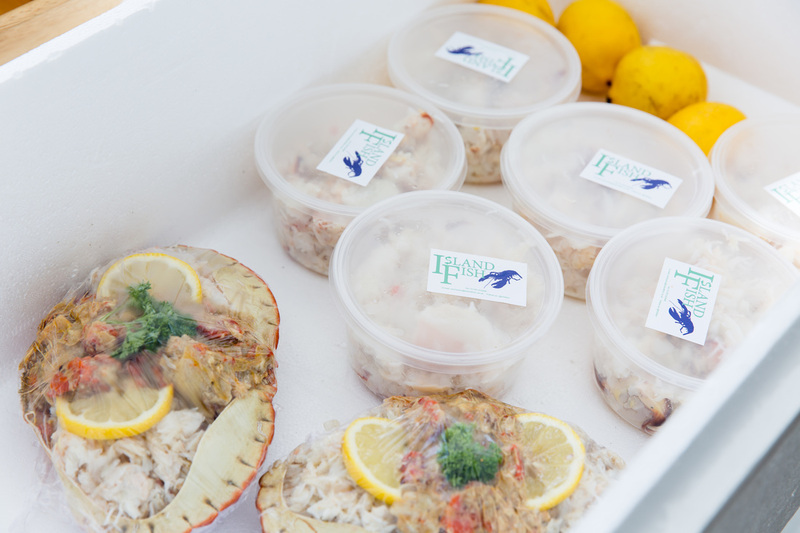 Our catch is brought ashore daily and our crab cooked and picked by mother and daughter team Sue and Amanda before being made into a range of tempting products. 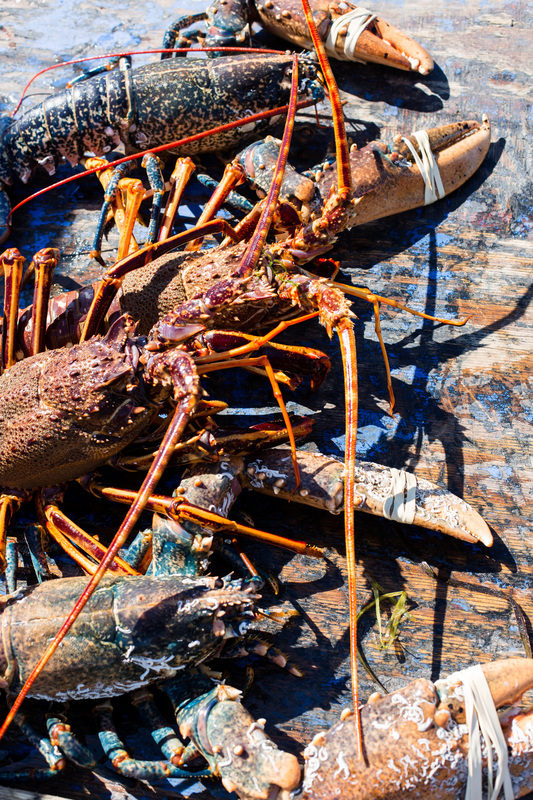 Island Fish can offer you the very best in locally caught Scillonian Fish & Shellfish. We can even tell you where your fish was caught! Thinking about making a purchase? Our catch is either stored at sea in wooden 'Carbs' or brought ashore daily for our shop. We cook & pick crab twice a day, starting the day at around 4.00 am so we have time to produce a range of shellfish treats before we open the shop at 9.30. If you would like to try Scillonian Fish & Shellfish we can supply the following: Lobster, live or cooked, Crab, live or cooked, picked crab, dressed crab, potted crab, crab sandwiches, lobster and crab salads and home made crab soup. Fresh fish subject to availability. For a more detailed explanation of our products go to Buy Fish. Making a purchase is easy. You can call Amanda on 01720 423880, email on contactus@islandfish.co.uk. or complete our Contact Form. If you've never ordered lobster or crab before don't worry, we are always happy to talk through your needs and advise accordingly. 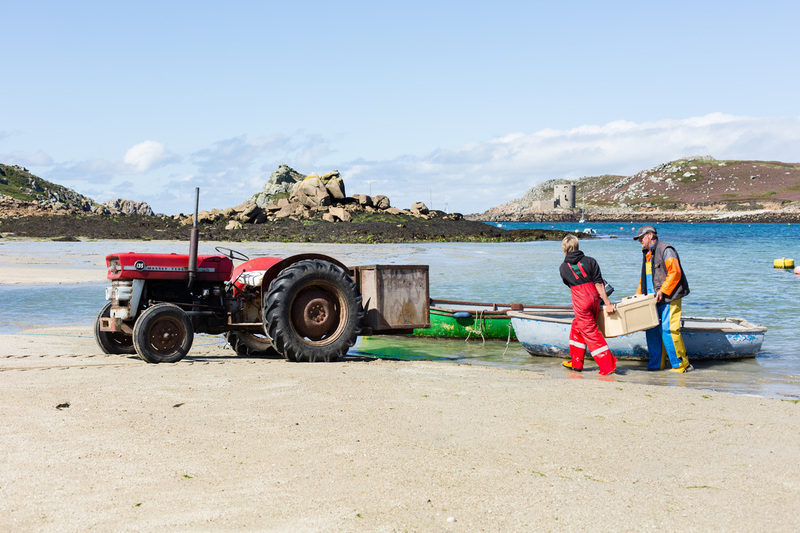 We deliver daily to Tresco free of charge five days a week, Tuesday to Saturday between 5.00 and 5.15 on New Grimsby Quay - your chance to meet the fisherman who caught your supper. For more information on placing an order go to 'Buy Fish'. 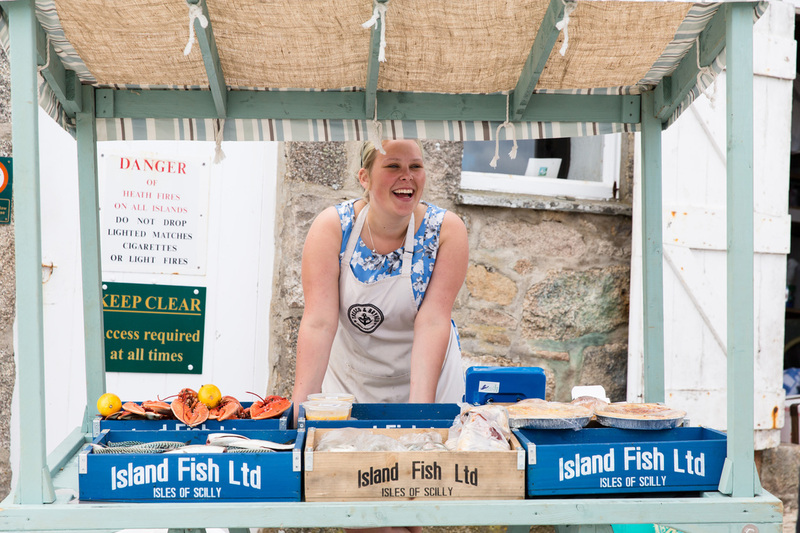 Between 1st April and the 31st October you can also drop into our 'New' Island Fish shop on Bryher at Bar, (just up from the beach with the wooden jetty) We are open Monday - Saturday, 9.30 - 5.30 and Sunday 10.00 - 4.00. 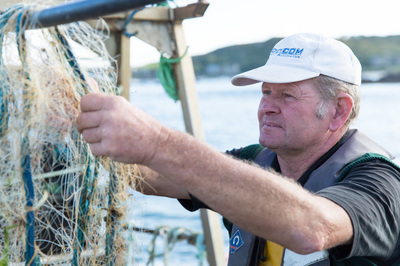 We also stock locally made shrimp nets for purchase or hire, plus a small range of maritime goodies. 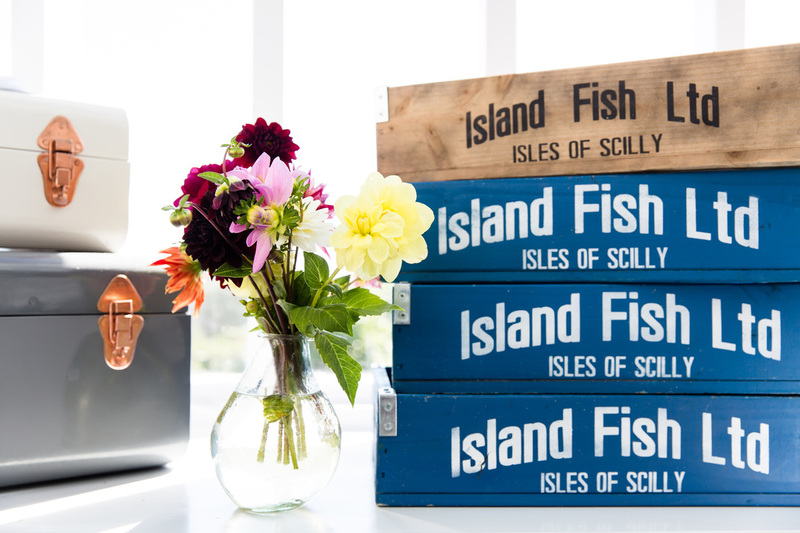 We have designed our shop to buck the trend that fish shops at damp and smelly, and instead Island Fish HQ is beautiful, a nice place to sit and spend some time doing absolutely nothing - do come and have a look. You can also find us on New Grimsby Quay, Tresco on Tuesdays between 3.30 & 5.30 with our 'pop up' stall. Come & say hello! 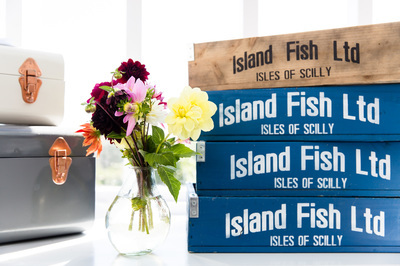 When you make a purchase from Island Fish you are helping to support the economy of Scilly. 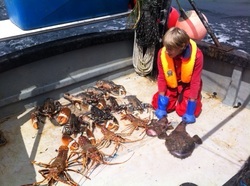 Not only do the family members behind Island Fish Ltd live work and play in Scilly we in turn are committed to buying locally where we can, working with others to strengthen our island community, not just for us but for the next generation of our children and our visitors children to enjoy. What's more, eating fish and shellfish is good for you. Fish & shellfish are a lean, healthy source of protein—and the oily kinds, such as mackerel deliver those heart and brain healthy omega-3 fats. Not surprisingly in 2015 one in 6 people decided to eat more fish! 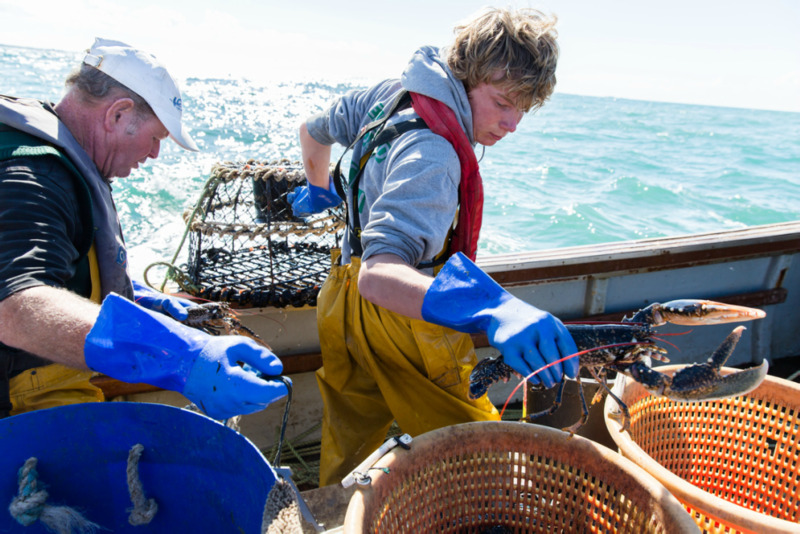 Island Fish is committed to the future of fishing in Scilly, Our ancestors made it possible for us to follow in their footsteps and we believe it is our duty to ensure the same for the next generation. For example we 'V' notch any berried female lobsters that we catch before releasing so that they can spawn their eggs. A 'V' notch means that these fish cannot then be landed. All of our Mackerel and Pollock is caught on hand lines meaning that there is zero by catch. Any fish that we have remaining at the end of the day is used either as bait for our lobster pots, for our supper or that of Simba the cat! 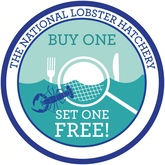 Island Fish is extremely proud to be part of the Buy One Release One Scheme run by the National Lobster Hatchery at Padstow. This means that for every lobster order we receive £1 is donated to the hatchery to support the release of juvenile lobsters into the wild. This means that you can purchase lobsters from Island Fish in the knowledge that you are helping to restock Cornwall & Scilly with the next generation of lobsters. .
Island Fish would like to thank Tresco Island and James Darling Photography for allowing us to use much of their fantastic photography. Thank you very much!